Egg tart is a very popular dessert in Hong Kong. People like to have a cup of milk tea (奶茶) along with one or two egg tarts for tea, feeling energy boosted up in heaven. My family and friends are big fans of this little angel. As for myself, I’m really addicted to eating the fragrant, silky egg custard inside the tart shells. Although making egg tarts is not difficult, I sometimes like to take a short cut and make some to ease my craving on the go. I might call this quick dessert as “Cheating Version of Egg tarts”. Prepare the filling: Use a sauce pan. Mix cream with milk, add sugar. Heat over low heat and cook until the sugar dissolves. Let cool completely. Stir in the egg yolks and flour. Combine thoroughly. Drain through a fine sieve. Set aside. Carefully fold one end of the filo pastry to match the opposite end. Repeat and fold once more. Then you’ll get a 4-stack pastries as picture shown. Use a pair of scissors to cut along the folded lines. Then cut each stack into 4 equal squares. You should have 16 stacks of little square pastries. Line a muffin tray with the square pastries. My muffin tray only can bake 12, so I have to place more pastries for some tarts and use up all the pastries. Evenly pour the filling into the pastry shells. Carefully transfer into the preheated oven and bake for 20 to 25 minutes, or until the pastry turns brown. Don’t leave them unattended while baking. If the egg custard puffs up, open the oven door a few inches. 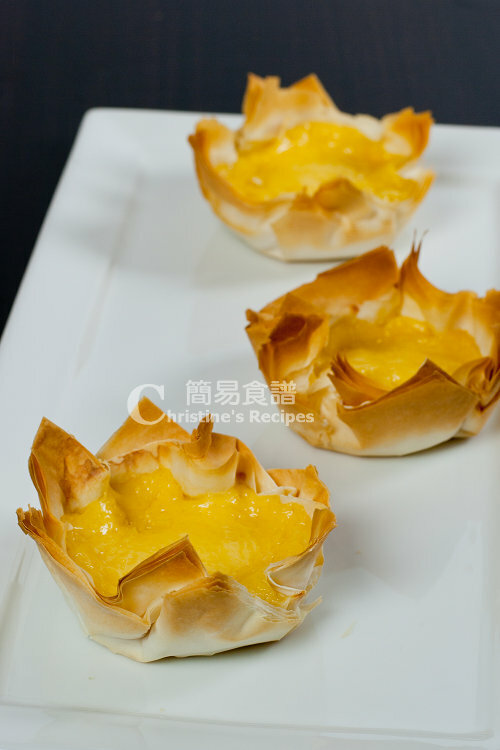 By doing this, the egg custard would not shrink too much once the pastry cools down. It’s normal that the filling shrinks a bit though. Note: You might use the leftover egg whites to make some Almond Meringue. Thanks for sharing this! Very creative. I never knew that fillo pastry was white and looked like that, interesting. It looks very pretty, like a sunflower. This is so pretty and looks so classic! These are darling and I love that you don't even use butter for the phyllo. 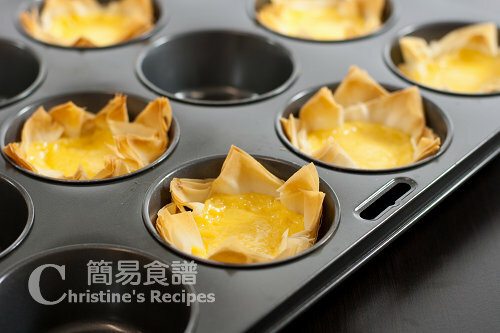 Love the idea of using filo pastry for these egg tarts!! Oh wow! This cheating version is great. Wil copycat! These look lovely and delicious. I just had egg tarts at a dim sum shop yesterday....really delicious. I have to try to make one of these days. Creative I would say and not 'cheating'! Very lovely indeed! Hey Christine - did you buy that round matt for pies? I am interested to get one - is it helpful? Also, thanks for sharing your recipe. My brother in law keeps on forcing me to make some with the leftover egg yolks I have from making macarons but I didn't have a reliable recipe. Well, now I do! What kind of "round matt for pies" are you talking about? I just used what I've got in my kitchen to make these tarts. Any baking tins will do as well. These look fantastic Christine! Thank you! Now please do jeen doui sesame balls with the mung filling! I love egg custard tarts....I love this idea! I've never made anything with phyllo pastry before but it looks so light and flaky- it looks delicious! Scrumptious little tarts - I love that you used filo pastry! What a clever 'cheat' ! You break the rules of making traditional egg tarts : ), but this is a real inspiration! 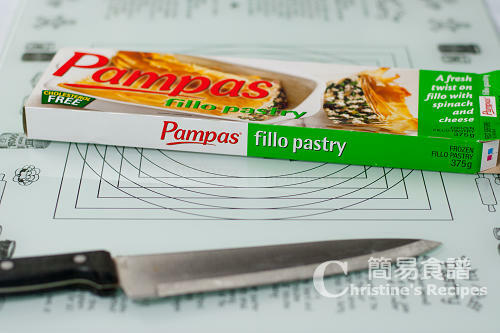 I have a question with regard to the Pampas fillo pastry in the picture. The packagin shows "spinach and cheese." We aren't going to buy this pastry for the egg tarts are we? Sorry if I have sounded dumb but I find the picture misleading. Thanks in advance for answering my question. The fillo pastry can be used to make savory and sweet dishes. You can read the instructions on the packet, if you have a chance to spot this product at any supermarkets. 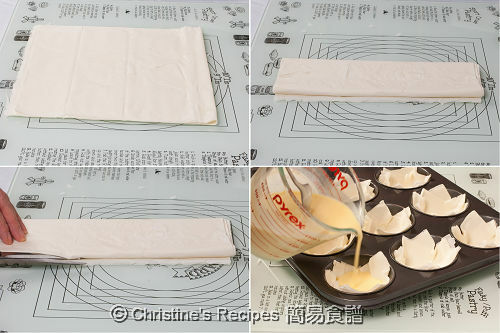 I'd suspect that wonton wrappers would be suitable for baking desserts. Usually, we cook wonton wrappers in water or hot oil. I haven't tried to bake them. Hmmm...do you want to run an experiment? Let me know how it goes if you've tried. Whipping cream is not sweet. You have to add some sugar and beat it with an electric mixer, then you can use it to decorate cakes and desserts. 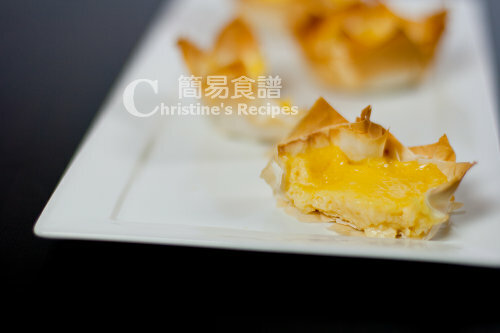 Can I use the recipe for the Cantonese egg tart custard for the cheating version instead? Sure, why not? Or you can make your own. Christine.....Trissa meant the white mat you have the filo laying on, With squares and circles marked out on it. Hi Christine ... can I use Spring Roll Skin instead of Pampas’s filo pastry? why do u use whipping cream here? not evaporate milk? Because I like the fragrance and freshness of whipping cream. Hi Christine, just wondering whether you can use puff pastry instead of filo pastry? Thanks! Some of my fans tried puff pastry. But I prefer filo pastry. How many tarts can be made with this recipe? Sure, you can. Feel free to experiment. Yet beware that filo pastry is easily get browned especially the edges. Can I just put the mixture in a pan, like a cake? And not use any pastry, skin, etc? And/or can I put the mixture in a muffin baking pan without using pastry? I haven't tried your way. I think you can make the custard without the pastry. You need to adjust the cooking time.